Sometimes, you just can’t tap into that power buried deep inside and you need other people to help you get there. This is last episode of the season 1 of Meaningful Work, Meaningful Life podcast. It was an exciting journey to produce these first 15 episodes. I’ve learnt so much about podcasting and from my awesome guests and hope that all the stories shared have helped you to reignite old dreams, to re-energise you to follow your dreams and live the life you want NOW. I am preparing a bonus episode for you next week – just with me before we start a very exciting season 2. I am sure you’ll love it. If you haven’t listened to the other episodes, go and listen to them, you will find real gems. 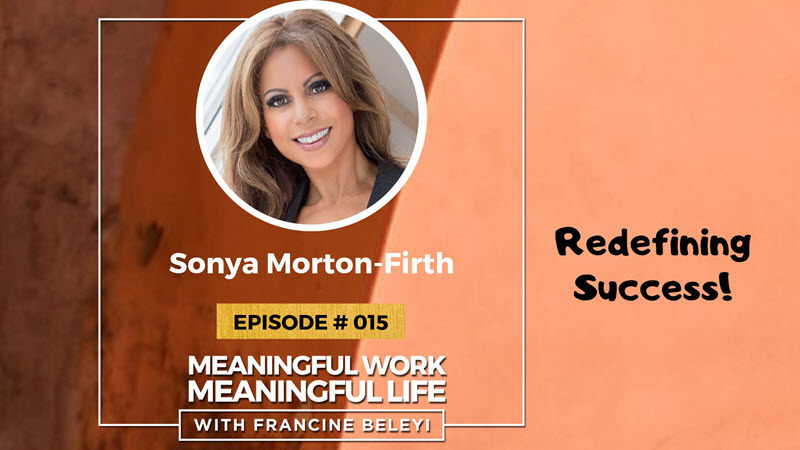 Today, I am excited to discuss with Sonya Morton-Firth, a High-Performance Executive Coach; Property Investor and Physique Competitor. Sonya left a corporate high-pressured sales job in the City of London after 20 years to start her business in fashion and fitness, building a strong brand but ended up selling this business to her partner. She confessed that she was successful but not fulfilled and that is the ‘ultimate failure’ as she puts it. She took what she learnt in her corporate life and in business to support businesses and help people discover their passion and their purpose. She opens about some tough moments when she lost her job, her home, and relationship in the same week. But also, how reaching this very low point in her life enabled her to grow and learn and even helped her discover her true purpose. She shares the strategies that she applied to get back on her feet. She also tells me how her definition of who she is has drastically changed in the past two years as she understands with time that it’s not just all about money! and there’s something much more important in life and feeling that you’re contributing. Why we should live our dream and not be constrained by fear. How to tap into your childhood dreams to find out what are you really want to do?